I have a huge love affair with recipes that come with an origin story, recipes like Tarte Tatin invented by mistake by the Tatin sisters in France, or Pavlova a dish created in honour of the Russian ballerina created in either Australia or New Zealand sometime in the 1920’s. Fairly often these stories have just a hint of truth, more myth that historical fact but there is still something about these stories that holds my interest. With the Paris-Brest we have a slightly more accurate understanding of the origins. The classic of french baking, a round choux pastry filled with a praline creme mousseline was created in 1910 by pastry chef Pierre Giffard. He was a big fan of cycling and the name and shape of the pastry was to reflect the Paris to Brest race that passed close to his shop just outside of Paris. Traditionally made with an almond praline it is now more commonly made with a hazelnut praline and is now one of the classics of French patisserie. The recipe below is based on the version in my book Patisserie Made Simple but over the years since I wrote the book I have slightly tweaked the recipe, although the changes are minimal so if you have the book the recipe in the book still works wonderfully. To make the Paris-Brest it’s best to start with the mousseline as it needs plenty of time to chill. Start by placing the milk in a large saucepan and bring to a boil over medium/high heat. Meanwhile place the egg yolks, vanilla, caster sugar and cornflour into a large bowl and whisking to combine into a thick paste (if it is too thick and the mixture wont combine add a small splash of the milk before its had a chance to heat up properly). To finish off the mousseline place the remaining butter into a large bowl and beat with an electric mixer until smooth and creamy, add the praline paste and mix to combine. If the butter is too cool and not at the right texture you run the risk of creating lumps in the finished mousseline so make sure the butter is nice and creamy before the next step. Remove the pastry cream from the fridge and using a whisk beat until brought back to a smooth texture. When it comes out of the fridge it will be a solid dense mass but with a little manpower it will smooth out. Add the pastry cream to the praline mixture into 3 or so additions, beating until fully combined before adding more. This slow combination of the two mixtures is simply to prevent lumps. Once everything has been combined you should have a mixture that has a texture similar to buttercream but lighter and much less sweet. If the texture looks a little shiny and loose placing the bowl in the fridge for up to an hour will really help. To make the choux pastry place the water, milk, butter, sugar and salt into a large saucepan and place over medium/high heat cooking until the butter has melted and the whole mixture comes to the boil. Remove the pan from the heat and in one go pour in the flour, mixing with a wooden spoon until everything comes together to form a dough. Initially it will resemble scrambled eggs but with a little mixing it will form a uniform dough. Place the pan back on the heat and cook, whilst stirring, for about 2-3 minutes or until a thin film has formed on the base of the pan (the film wont happen if using a non-stick pan). Pour the dough into a large bowl and mix for about 30 seconds to cool slightly. You can use an electric mixer or a wooden spoon for this, but you'll be mixing a lot so a wooden spoon will be quite a workout. Add the eggs one at a time, beating until fully incorporated before adding more. With choux pastry the amount of egg is always a guide, you'll need to make it a few times to really get the feel for the recipe. The end result you are looking for is a pastry with a slight gloss and one that holds a v-shaped ribbon when the wooden spoon is lifted from the bowl. To get a better indication of what the finished dough should look like, give my YouTube video a look, it really helps to see the finished texture. Line two baking trays with parchment paper and use an 8cm round cookie cutter, dipped in flour, to mark four circles as templates onto each piece of parchment. Place the choux pastry into a piping bag fitted with a french star tip and pipe rounds of pastry, using the templates as guides. Sprinkle liberally with the hazelnuts. Bake in the preheated oven for about 30 minutes or until golden brown. Turn off the oven and allow the pastries to dry out for about 10 minutes or so before removing and allowing to cool to room temperature. To assemble the Paris-Brest use a serrated knife to cut the rings of pastry in half. Pipe a little extra praline paste into the base of each choux pastry and top with mousseline cream. The easiest way to do this is to place the cream into a piping bag with a french star tip and pipe peaks of the cream around the ring of pastry. Finish by placing the disk of pastry on top and dusting with a little icing sugar. The elements can all be made ahead but once assembled these are best on the day made. It might seem odd to use oregano in a sweet recipe as it really isn't that common, but trust me, this works so well. We have all become more and more accustomed to herbs traditionally used in savoury cooking appearing in desserts, think of a lemon and rosemary cake, a pear and thyme cake. How about a herbaceous basil ice cream, all much more commonplace these days but this isn't the case with oregano. It still seems a little unusual in a sweet dish and to be honest I wasn't 100% sure it would be a success, but when Schwartz asked me to try it I accepted the challenge and this is the result. When thinking about how herbs blend with sweet flavours there a few common themes but the main one is lemon, it really helps bridge the gap between the sweet and the savoury, it gives balance. The key to making any herb pairing like this work is balance and think of the lemon and the stuff that holds the whole recipe together. Use too much of any herb and the balance will be thrown off and use too little and well you just cant taste it. When playing around with this recipe I found the compote could stand up to a fair amount of the oregano, because the berries aren't the most assertive flavour for a fruit but more mellow and gently sweet the oregano didn't fight too much and just blends together really well. It gives the blueberries a wonderful depth and the herbaceous flavour adds really interest and actually intensifies the flavour in the compote. You could serve this compote on waffles or pancakes with maple syrup, which would be a divine combination, or you can use it as I have as the topping for a simple summertime cake. The cake is made with the same combination of lemon and oregano but in a gentler way, it’s less upfront a flavour but the inclusion of these flavours helps it pair wonderfully with the compote. In the compote, the lemon is the bridge that connects the two ingredients but in the full recipe with the cake and the compote, the bridge is a white chocolate cream. The three elements together create a wonderful dessert that may seem unusual at first but which are a great way to play with different flavours and try something new. The compote recipe is below but if you would like the full recipe visit the Schwartz blog here. This recipe and post was sponsored by Schwartz. To make the compote place half of the blueberries and all the lemon juice, sugar, vanilla and oregano into a small saucepan and cook over medium/low heat for 10-15 minutes until the berries have started to break down and they have released a lot of juice. Add the remaining berries and stir to combine. Place the cornflour into a small bowl and add a few spoonfuls of the blueberry juice and mix until smooth. Scrape the cornflour slurry into the pan and cook for a few minutes until the compote has thickened. This compote is pretty low on sugar, you could cook it longer to reduce and thicken the liquid but the berries will break down further and the compote will taste sweeter and the joy of this is that is bright and just sweet enough, the cornflour therefore helps to thicken the compote in place of the sugar. Pour the compote into bowl, cover with cling film and refrigerate until needed. To use the compote I have paired it with a simple lemon and oregano cake with a white chocolate cream, for that recipe head over here. Since visiting Siciliy earlier in the year I regularly day dream about granita for breakfast, a common Sicilian way to start the day. When you think of the current heatwave we are going through it is totally understandable how a hot morning coffee might not be the most pleasant way to wake up but a cold refreshing espresso granita on the other hand, well that I can get behind. Whilst coffee is one of my go to flavours right now I am favouring bright fruity flavours and right now that means strawberries. I don’t know if our recent summers have had an effect on this years crops but English strawberries are tasting absolutely fantastic at the moment and I am crushing hard (as you can probably tell by my recent crop of recipes) and this recipe is a kind of cross country love letter to strawberries. The granita is Sicilian in style, less icy and more towards a sorbet and the ice cream is of the Philadelphia style so no eggs and minimal effort, it also leads to a cleaner more dairy forward flavour and the yolks don't have a chance to dull the flavour of the vanilla. But the combination of the granita and ice cream cant help but make me think of that classic British treat of strawberries and cream. If you're looking for that easy recipe to make this summer this might be the one. To make the granita add all of the ingredients to a large bowl and toss together. Set the bowl aside, allowing the fruit to macerate, for about 30-60 minutes or until the sugar has dissolved and the berries are sat in a bowl of ruby red strawberry juice. If you wanted a subtle mint flavour at the moment you could also set some mint into the bowl with the berries. Using a blender or food processor pulse the berries until smooth, then pass through a fine mesh sieve to remove the seeds. Pour the strawberry puree into a wide container that will fit into the freezer and allow to chill for about 4 hours. Every 30 minutes or so use a fork to break up the ice crystals, until you have a slightly icy, slightly slushy texture. At this point the granita is ready to serve. To make the ice cream add all of the ingredients to a large bowl and gently whisk together, you're not adding air you just want to encourage the milk powder and sugar to dissolve. Once everything is fully incorporated and the sugar has dissolved churn in an ice cream machine according to the manufactures instructions. If you don’t have an ice cream machine there are other ways, similar to the granita method, to make ice cream but the results wont be as good. I am a big fan of homemade ice cream and the small investment needed for the equipment will absolutely pay off over a summer (especially as basic models can be very cheap these days and generally do a decent job). When the ice cream has the texture of soft serve scoop it into a suitable container, I use a loaf tin, and place into the freezer for about 4 hours or until firm but scoop-able. Bear in mind that Philadelphia style ice cream will not last as long as ones made with a custard so it needs eating within a few days. To serve scoop some vanilla ice cream into small glasses and top with plenty of granita. Let’s be real, it’s so hot in London at the moment that there is no way I want to spend hours and hours in the kitchen baking, this is the time a simple quick dessert is called for. You really can’t get much more British than serving a trifle made with strawberries and Pimm’s, served in the middle of Wimbledon, it’s just a perfect dessert for the season. With the tennis finally underway this is a great dish because it’s made in advance, so if you (like my mum does every year) have friends coming round to watch the finals then this might be the perfect dish to serve to celebrate the winners. For the jelly I have used apple juice as its flavour pairs really well with other things, so in this case without overpowering the Pimm’s. If you want to add another layer of flavour you can also use apple and elderflower juice which is another delightful British summer flavour, that happens to also go wonderfully with Pimm’s. To make the jelly, place the gelatine sheets into ice cold water and set aside for 10 minutes. Place the apple juice, lemon juice, Pimm’s, sugar and mint leaves into a saucepan and place over medium heat and heat until steaming, remove from the heat and remove and discard the mint. Stir in the gelatine until dissolved then set aside until room temperature. Divide the fruit between 6 glasses and pour over the gelatine. Set the jellies into the fridge for a few hours until set. Meanwhile make the custard, place the milk into a saucepan with half the sugar and the sliced ginger. Place over medium heat and bring to a simmer. Set aside and infuse for an hour. Remove the ginger and place the milk back on the heat and bring to a simmer. Meanwhile place the eggs, yolks, the remaining sugar and cornflour and whisk to combine. Remove the milk from the heat pour over the egg mixture, whisking to combine. Pour the custard back over the heat and whisk constantly until thickened, pour immediately into a bowl and mix in the vanilla. Press a piece of clingfilm onto the surface of the custard and refrigerate until the jellies have set. To assemble place a few amaretti on top of each jelly and top with custard. Place back into the fridge for at least an hour before serving (this will soften the amaretti, making it more like a traditional trifle texture). To serve top with a little lightly whipped cream, a few extra berries and if you have any of the syrup left from last weeks recipe a little drizzle of that too. As I am writing this Britain is experiencing that elusive summer heatwave, everyone is walking around confused as to what that ball of heat in the sky is and why it’s so nice outside! I’ve currently escaped my sauna of a kitchen and am currently daydreaming of days at the beach and BBQ’s but as we get closer to July my mind starts to turn towards the English institution of Wimbledon, two weeks where I’ll eat a whole host of strawberries and cream, pretend I follow the tennis year round, and enjoy the whole experience with a glass or two of Pimm’s. I am doubly excited this year as whilst I always watch the tennis at home, this year for the first time, I will actually be there, in SW19, for the main event and I absolutely cannot wait! In the run up to the championship I am partnering with Pimm’s to give you guys some fabulous dessert ideas to enjoy during the summer season. Today’s recipe is one of those recipes you don't have to stress about making in the heat, there’s no baking so the kitchen, and most importantly you won’t end up hot and sweaty. The first recipe for this partnership is Pimm’s No-Bake Cheesecake Tarts with a Pimm’s Strawberry Topping, it’s the perfect thing for a Wimbledon watch party or for a BBQ this summer. To make the cheesecake tart bases place the oat biscuits into a food processor and pulse until fine. Pour in the butter, sugar and salt and pulse to distribute evenly. Alternatively place the biscuits into a ziplock bag and use a rolling pin to bash into a powder, then pour into a bowl and stir through the sugar, salt and butter. Divide the biscuit mixture between 8 loose bottom 10cm tart tins and press firmly into the bases and up the sides of the tins. I find a rolling pin works wonderfully for this, just make sure you press the mixture firmly so that it is compacted otherwise when you remove from the tins they'll fall apart. Place the tart tins into the fridge. For the cheesecake mixture place the cream cheese, icing sugar, salt, Pimm’s, vanilla, lemon zest and juice into a large bowl and whisk together until smooth and combined. In a separate bowl whisk the cream until it holds soft peaks and then carefully fold it into the cheesecake base. Divide the mixture between the prepared tart shells and refrigerate for about 4 hours or until the cheesecake mixture is firm. Meanwhile make the strawberry topping, place the Pimm’s, caster sugar and lemon juice into a small saucepan and heat over medium heat and cook until the sugar has dissolved then continue cooking for about 5 minutes or until the mixture has reduced and is syrupy. Remove from the heat, add the mint leaves and stir together for a couple minutes before removing and discarding (the heat of the syrup will draw out the flavour and if left in there much longer the mint will come to dominate the flavour). Whilst the syrup is still hot add the strawberries and set aside to cool. When ready to serve lightly whip the cream and spoon atop the tarts, along with the strawberries and a little of the syrup. You will be left some syrup which you can use to make Pimm’s cocktails, or you could pour over ice cream and fold through an eton mess. The sun is finally out and the summer fruit is starting to come into season which means one thing, strawberries! There is something almost nostalgic to strawberries for me, maybe it's the many trips to pick your own farms in Devon when me and my brother were little or maybe its just one of those flavours we universally associate with childhood? Regardless, those sweet and vibrant berries are the perfect summer fruit, especially when good berries come into season, not the flavourless, comically big, polystyrene textured versions that magically appear on supermarket shelves all year round. When the berries are good you really dont want to mess with them too much, the flavour of the berries is more than enough so simple is always better. This dish is therefore finished with fresh berries that have been macerated in the smallest touch of sugar, just enough to lightly gild the lily. The base of the tart is a frangipane, a spin on that classic Bakewell Tart filling, but using a scattering of vibrant green pistachios, a flavour that goes so well with strawberries, and just a big enough twist to make this seem different and a little unusual. If you don't fancy using pistachios you can substitute just about any other nut for the pistachios, just keep the ratio of almonds to the other nut the same. Cut the vanilla pod, if using, in half and scrape out the seeds. Put the seeds in the bowl of a food processor, add the flour, almonds, icing sugar and salt, and pulse to combine. Add the butter and pulse until the mixture resembles breadcrumbs. Add the egg yolks and water and pulse until fully combined. (Alternatively, put the flour, almonds, icing sugar, salt and vanilla in a large bowl and mix to combine. Add the butter and rub together using your fingertips, or use a pastry cutter, until the mixture resembles breadcrumbs. Add the egg yolks and water and mix together until the dough just starts to come together.) Be careful not to over-process the dough, or the finished pastry will be tough and chewy, you only want to mix the dough until it starts to clump together, not until it forms a uniform dough. Turn the dough out onto a lightly floured work surface and gently bring together with your hands, very gently kneading into a smooth, uniform dough. Divide into two pieces, pressing into flat rounds. Wrap the pastry in clingfilm and rest it in the fridge for at least 1 hour before using. As with most pastry, this can be chilled and kept for up to one week before using, or it can be frozen for up to a months. This recipe is enough for two large tarts so you can either make a half batch or use one portion for another recipe. Preheat the oven to 180C (160C fan). Take the disc of pastry out from the fridge and lightly flour the work surface with a little flour. Roll the pastry out until it is about 3mm thick. Roll back onto the rolling pin then gently unroll into a 9 inch loose bottomed tart tin. Gently lift up the excess pastry and press it into the corners of the tin, if you press the pastry in without lifting it up, you risk stretching or ripping the pastry and if it stretches its more prone to shrinkage. If you want to see how this method works check out my video on YouTube. Trim off the excess pastry and refrigerate the tart shell in the fridge until the pastry is firm. Line the tart with a crumpled piece of parchment paper and fill with rice. Bake in the preheated oven for about 25 minutes then remove the rice and parchment and bake for a further 5-10 minutes just until the top edge of the tart shell is browning and the base is set but with just a hint of colour. Remove from the oven and allow to cool then brush all over with a beaten egg yolk and bake a further minute or so until set, this will prevent the pastry from becoming soggy when we add the frangipane. To make the frangipane place the butter, sugar and lemon zest into a large bowl and using an electric mixer beat together until light and fluffy, about 5 minutes. Beat in the eggs one at a time then mix together the dry goods and stir into the butter mixture, mixing until fully combined. Spread the frangipane inside the tart shell and sprinkle with a few extra chopped pistachios (optional). Bake in the preheated oven for about 25 minutes or until the frangipane is lightly browned and springs back to the touch. Remove from the oven and set aside to cool fully. For the topping slice the stalk from the strawberries and cut in half, placing into a bowl. Sprinkle the sugar over the strawberries (if they are rally flavourful and sweet they will only need 1 tablespoons if they need a little extra boost in flavour use the full 2 tablespoons) and set aside for about 30 minutes to macerate, this will help boost the flavours and draw out some of the moisture which also looks great on the finished dish. To finish top the tart with the strawberries and sprinkle with a few chopped pistachios. Once the tart is topped with the strawberries it is best the day served but you can make the tart a day or two in advance just doing the strawberries when ready to serve. Can you tell I am on a pistachio kick at the moment? The babka, todays cookies and I've just realised next weeks recipe is also heavily focused on these nuts. I would apologise but three delicious recipes with pistachios is no bad thing! Todays recipe is probably the easiest of the three and you can get these cookies in the oven in no time at all. These were inspired by my recent work trip to Sicily, where every pastry and ice cream shop seems to sell the most incredibly flavoured almond and pistachio treats, which makes sense when you realise some of the best almonds and pistachios in the world come from Sicily. This recipe uses both Italian ingredients and an Italian recipe, it's a twist on the amaretti. The style of amaretti I prefer is a slight chewy crust with a tender centre. There is nothing wrong with the crunchy or super chewy varieties this is just my preference. When it comes to the pistachios you can use the varieties found in supermarkets but you will notice they don't have the vibrancy of colour that comes from my preferred skinless, blanched variety (like these from SousChef) so the finished cookies will be a little flatter in colour. Pistachios are however pretty expensive, the green ones even more so, so choose the variety you are happy with and they will all taste wonderfully. To make the cookies preheat the oven to 180C (160C Fan) and line two baking trays with parchment paper. Place half of the almonds and all of the pistachios and salt into a food processor and pulse until the pistachios are finely ground. The reason for adding half of the almonds with the pistachios is these vibrant green pistachios are on the soft side and if processed alone can become more of a paste rather than a powder like mix, adding some of the almonds prevents this from happening. Add the remaining almonds and blend to combine, then tip into a large bowl and mix through about half of the sugar. In a large bowl, using an electric mixer, whisk together the egg whites until foamy then slowly add the remaining sugar whisking until the meringue is in stiff peaks. Working in two additions add the meringue to the almond mixture along with the vanilla. We are not making meringue so don't worry too much about keeping all the air in the meringue, just make sure the mixture is evenly combined with no streaks of meringue. Once fully combined use an ice cream scoop (I use one about 1 heaped tablespoon in size) to form the cookies, dropping first into a small bowl of caster sugar, tossing to coat fully. This sugar coating gives the cookies the characteristic chew. 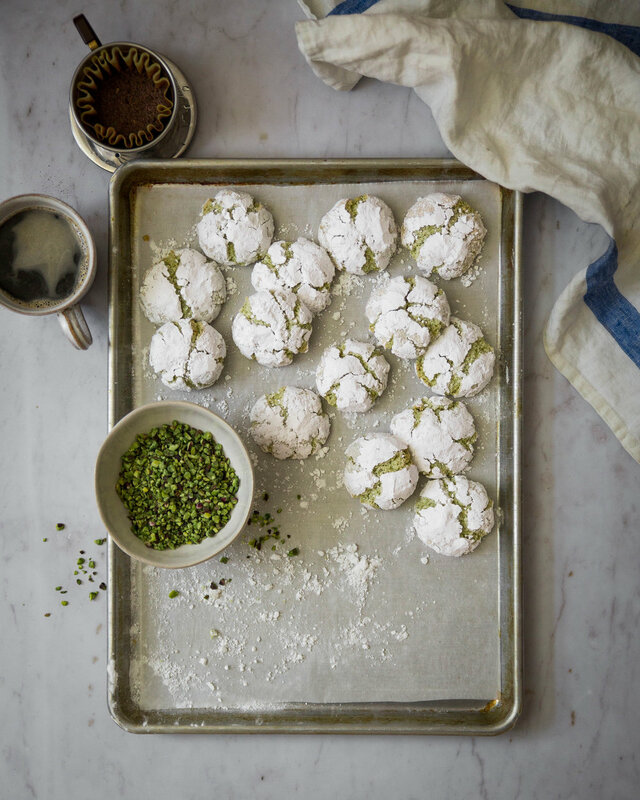 To give the look of amaretti toss the cookies into icing sugar, rolling to coat fully and shape into a ball. Place the cookies onto the prepared baking trays, a few centimetres apart and then bake in the preheated oven for 12-14 minutes. Bake just until the cookies have the smallest hint of browning where the cookies are cracking. Remove from the oven and allow to cool fully before enjoying. Because of the ingredients these cookies will keep for a long time, at least a week in a sealed container. The longer the cookies sit the chewier they become. What is the birthday cake of your dreams, the one you had as a kid and secretly crave every year. It has to be the Devils Food Cake right? A rich, moist layer cake that packs a hell of a chocolate punch and fulfils all your childhood nostalgia needs, it’s the perfect chocolate cake and the one I make time and time again. I have been playing around a lot with chocolate cakes recently, trying to develop something extra special and whilst I was playing around in the kitchen I saw the recipe for Stella Parks’, aka Bravetart’s, Devils Food Cake. At first glance it looked to me like the perfect example of a devils food, the perfect crumb, the perfect colour and layers that stood tall and proud. I was doubly sold on the recipe once I realised it was basically an all in one method, no stand mixer needed here! The desire to bake it was stuck in my head so I got in the kitchen and gave it a whirl and guys, it is one of the easiest and best chocolate cakes I have ever made, so much so that I had to share it with you (and you know how rarely I post other peoples recipes). The recipe comes from Stella’s incredible book BraveTart, a dream of a book that was clearly written over a long period of time with a hell of a lot of testing, which is sadly not as common as you would think for baking books. If you love baking you have to get this book, I think it is one of the best baking books in years! But back to the cake. A classic Devils Food needs to be frosted with something nostalgic, something like a quick fudge frosting (which I generally find a tad too sweet), so I decided to use a sour cream ganache frosting that I had originally developed for a different cake. It has the gloss and texture of the lightest buttercream but the full on chocolate flavour you get from a ganache. In my version I only use a portion of sour cream to double cream simply because I find versions made with 100% sour cream have too much tang that gets in the way of the chocolate flavour, just a little tang however really helps to lift the flavour and balance out the sweetness in the cake. If you don't already go and follow Stella on Instagram and check out her book BraveTart, she is also resident pastry wizard over at SeriousEats so make sure to check out all her new recipes on there too. To make the cake preheat the oven to 180c (160c fan) and lightly grease 3x20cm round cake pans and line the base with parchment paper, Stella recommends deep tins 3 inch deep pans instead of the more common sandwich tins as with shallower tins the cakes are more likely to dome and rise less. Place the butter and coffee together in a large bowl and set over a pan of simmering water and heat, stirring occasionally, until the butter is fully melted. Remove the bowl from the heat and add the cocoa powder and chocolate and mix together until the chocolate is melted. Add the light brown sugar and vanilla and mix together until combined, as brown sugar has a tendency to clump make sure to work out any big lumps of the sugar. Add the cold eggs and egg yolks and whisk into the batter until fully combined. Finally mix together the flour, baking powder and salt and sieve over the chocolate mixture, mixing together until just combined. Divide the batter between the prepared pans, preferably weighing to make super equal layers, and bake in the preheated oven for about 30 minutes or until the cake is starting to come away from the sides of the pan and springs back to a light touch. Allow the cakes to cool in the pans for 10-15 minutes before inverting onto wire racks to cool completely. To make the frosting place the chocolate into a heatproof bowl and set over a pan of simmering water and heat, stirring regularly, until fully melted. At the same time place all the remaining ingredients, except the sour cream, into a small saucepan and place over medium heat and cook, stirring frequently until the the butter and sugar has melted and the mixture is smooth. Remove both from the heat and combine together. As this ganache has a high proportion of liquid I find it useful to make this ganache a slightly different way to what I normally do (this is a more traditional/professional way of making ganache). Pour the cream over the chocolate in three additions, stirring gently in the middle of the bowl until the two mixtures are combined and a super glossy finish is achieved. Doing it in three additions like this makes sure the emulsion of the ganache is very stable and is unlikely to split. Finally add the sour cream and fold into the ganache. Set this mixture aside until it has thickened enough to spread and use like a regular frosting. To assemble the cake first use a serrated knife to level the cakes, if needed. Place the first cake layer onto a plate or cardboard cake round and spread with a small amount of the frosting (I use an ice cream scoop to measure out the frosting so the amount going between each layer is equal) spreading it so it is just peaking out over the sides, but just barely. Repeat with the second layer of cake and then finally add the third cake layer and top with the remaining frosting spreading over the top and sides of the cake, decorating in whatever manner you prefer. One of the wonderful things about Stella’s Devils Food is that it stays fresh for a surprisingly good amount of time, I have now made this cake multiple times and have served it up to five days after baking and people were still incredibly complimentary which is a big plus for me with this cake. Yesterday morning I sadly flew home, back to London after a few days working in Sicily, where I took as much time as I could to eat gelato and enjoy the weather . It was a whirlwind of a trip, travelling across the island, seeing and eating as much as possible. I was busy working so unfortunately didn't get to explore as much as I would normally like but of course I did manage to sneak away from my duties to get hold of some local ingredients to bring home to bake with, I'm talking hazelnuts, lemons, oregano and of course pistachios, possibly one of the most well known Sicilian ingredients. Next time I visit I want to go to the source and explore Bronte. Whilst I was on the island I tried pistachio in gelato, granita (my new favourite thing), cannoli and even in a few savoury dishes. Of course I wanted to use the nuts in a recipe and the one that sprung to mind is one that I have been meaning to share for far too long. Over the last five or so years as the trend for Babka has come and maybe even gone, I totally fell in love with them. A swirled loaf packed full of chocolate and nuts then soaked in syrup, whats not to like? My version is fairly standard, a soft brioche style dough enriched with butter and eggs, swirled together with a mixture of butter and chocolate, covered in pistachios and baked. The dough I use is based on my cinnamon bun dough but with more egg and a touch more butter. I find that using a dough that is light on the additions of butter and egg makes for a much drier loaf because the dough is rolled fairly thin it can have a tendency to dry out so a properly enriched dough really helps make the perfect babka. When it comes to the filling I have taken a big queue from the recipe for Krantz Cake in Ottolenghi's book Jerusalem. I have tried many versions over the years and his is by far the best so I have based my recipe on that version, although there are a couple key differences but these mainly come down to flavour preference and ease of making. Like many recipes for Babka this makes two loaves and while you could of course reduce the recipe in two I love the ability to have one of these loaves in the freezer ready to whip out when needed. To make the dough place the flour, yeast, salt and sugar in the bowl of an electric mixer and mix briefly together to combine. Pour in the milk and the eggs and, with the dough hook attached,mix together on low/medium speed for about 10-15 minutes or until the dough is no longer sticking to the sides of the bowl and is elastic. With the mixer still running add the butter and mix until fully incorporated into the dough then continue mixing for a further 10-15 minutes or until elastic and no longer sticking to the bowl. Form the dough into a ball and place into a lightly oiled bowl, cover with clingfilm and refrigerate overnight. In the morning start off by making the chocolate filling. Place all of the ingredients except the pistachios into a small saucepan and cook over low heat until fully melted and smooth. Be very careful, stirring constantly, to prevent the chocolate catching on the pan and burning. Set aside for 20 minutes to cool and thicken slightly. Whilst the loaves are rising preheat the oven to 180C (170C Fan). When risen remove the clingfilm and bake for about 30-35 minutes or until the loaves are golden brown on top. Whilst the loaves bake, make the syrup by placing the sugar and water into a small saucepan and bringing to a simmer. Once the sugar has fully dissolved turn off the heat and set aside until needed. Once the babka has baked remove from the oven and brush liberally with the syrup, it will seem like a lot but trust me and use it all. Allow the loaves to cool fully before cutting into them, otherwise the bread will end up doughy and dense. If you are freezing one of the loaves, once cooled wrap in two layers of clingfilm and a layer of foil. When you come to defrost the loaf leave it at room temperature, still wrapped, for a few hours. This way as the babka defrosts the condensation that forms ends up on the outside of the loaf and doesn't effect the quality. Fresh from the oven the babka will keep for about three days. I think, after doing this job for eight years now, I have come to recognise when I become besotted with an ingredient and it becomes all I want to use. It has happened with cardamon, passion fruit, caramel and a whole host of ingredients far too long to list. But one ingredient has been a constant, my baking companion, the ingredient I turn more than anything else, and of course that is chocolate. I don't discriminate, I love everything from the candy bars I grew up with to the fanciest single estate, rare bean bar. Chocolate is a magic ingredient and I will never tire of using it. Now when it comes to white chocolate, I love it for different reasons. I do love to eat it occasionally, I like its more simple sweetness, its creamy flavour, it’s comforting almost. Sadly, however, it’s hard to deny that the flavour is a little more one-note, none of the complexity of milk and dark chocolate. That is unless you cook it slowly and caramelise it, and you absolutely want to do that! I’m not sure I can tell you just how good these tarts taste, you really need to bake a batch yourself. Think a white chocolate cheesecake but which someone has completely slathered in salted caramel, do I really need say more? This recipe uses the joy that is caramelised white chocolate, mainly because I have a small obsession with the stuff. It is dangerously easy to make, it takes the flavour of white chocolate up to a ten, adding a full dulce de leche note to the creamy vanilla notes of the chocolate, and it becomes this golden nectar that you could eat with a spoon. To further complement the flavours in this recipe I have also infused the cream for the ganache with a little spice, some fresh ginger, cinnamon and cardamon. The spicing is on the more subtle side but it really rounds out this recipe wonderfully. To start this recipe you first need to make the caramelised white chocolate. Whilst this recipe only uses 150g it is easier to make in bigger batches, normally I don’t make less than 300g, thankfully it keeps for months so you can use the extra in a different recipe. Roughly chop the chocolate and place onto a rimmed baking tray and place into the oven for about an hour, to an hour and a half, stirring every ten minutes until the colour has gone from cream to a rich caramel colour. The darker the colour the stronger the flavour change will be and the more caramel like the chocolate will become. Think of making this chocolate the same way you brown butter, it is the milk solids in the white chocolate that caramelise and add such an amazing flavour. When it comes to the stirring, make sure every ten minutes you give the chocolate a thorough stir, making sure to scrape the chocolate from the bottom of the tray otherwise it may catch and burn. As the chocolate cooks don’t worry if the chocolate seems grainy, when you stir it, the chocolate will liquefy again. Once caramelised scrape into a container and set aside until needed. As the chocolate sets, because you haven't tempered it, the chocolate will look streaky and maybe grainy, this is absolutely fine as you’ll be melting the chocolate for the recipe. Before making the cheesecake infuse the cream for the ganache. Add the cream, ginger, cinnamon and cardamon to a small saucepan and set over medium heat and bring to a boil. Turn off the heat and set aside to infuse. When ready to bake these tarts we first need to prevent the pastry from becoming soggy. Take the two leftover egg yolks and beat together and use a pastry brunch to coat the inside of the tart shells with the egg. Place these tart shells into a hot oven for a few minutes until the egg has set. For the cheesecake filling, whisk the cream cheese until smooth then add the sour cream, egg, egg whites, sugar and vanilla until the cheesecake mixture is smooth. Scrape the cheesecake filling into a jug and divide evenly amongst the prepared tart shells, filling about two thirds full. Bake for about 12-14 minutes or until the cheesecake is set around the edges but still has a little wobble in the middle. Remove from the oven and allow to cool to room temperature before transferring to the fridge for 30 minutes. For the ganache place the cream back over the heat and bring to a simmer. Place the chocolate into a bowl with sieve set over the bowl. Pour the cream through the sieve to remove the spices then set aside for a couple minutes before stirring together to form a smooth silky ganache. Pour the ganache onto the tarts and when the ganache starts to set, sprinkle with a little flaked sea salt. I find these tarts are best kept in the fridge, which will allow the tart shells to stay crisp longer, around 2-3 days. I am currently day dreaming about Paris, longing for a lazy morning drinking coffee at my favourite coffee shop in Belleville, wandering the streets of Le Marais going from patisserie to patisserie, finishing the day with a carafe of rosé at my favourite street side wine bar. I get this same feeling every time spring starts to rear its head, when the sun starts to show itself and flowers appear everywhere. Maybe it is because Spring is one of my favourite seasons in Paris or maybe it is when I grow weary of London and need to escape for a while, either way without a trip planned anytime soon I will have to get my francophile fix by making some pastries. What do you get when take a croissant but as you roll and fold the dough you liberally sprinkle in a layer of sugar? This magical sounding pastry is the kouign amann, which is Breton for butter cake. Butter cake, does anything sound better than that? The folk in the north of France, in the Brittany region, are known for their love of, and the production of, wonderful butter and salt and they put it to very good use in their pastries and confections. If you've had anything salted caramel flavoured then you have Brittany to thank. I happen to think it is the kouign amann though that shows off the flavours of Brittany best, a sweet caramel laced pastry laminated with butter, simple but absolutely delicious. I would say they were elegant but really this is a rustic pastry, that has over the last few years slowly become a trend with the pastry becoming the trademark offering at more than a handful of bakeries (if you ever go to San Francisco both Jane The Bakery and B.Patisserie make world class versions), and these bakeries dont just make the classic version, they have peppered them with flavours as simple as chocolate or apple and flavours as unusual as black sesame. The version below is from my book Patisserie Made Simple and uses a version of my simplified croissant dough, although these are quicker to make than the croissants themselves, if you want to dig further into French baking then make sure you check out my book. Put the milk plus 60ml lukewarm water in a medium bowl and mix to combine, then let sit. Put the flours, yeast, 2 tablespoons of the sugar, and the salt into a large bowl and mix to combine. Dice 125g of the butter into cubes. Add to the bowl and using a pastry blender cut in the butter briefly to form large chunks. This is the most important stage: if the butter is mixed too much into the flour, the dough won’t expand and puff up as it bakes, so it is better to err on the side of caution. If you can’t see chunks of butter, you have blended in the butter too much. Transfer the butter and flour mixture into the liquid, and using a spatula, fold the dry ingredients into the liquid, trying to combine everything without making the butter pieces any smaller. Once you have formed a rough dough, transfer to the countertop and very lightly work it into a ball of dough. Form the dough into a flat rectangle, wrap in plastic wrap and put it in the refrigerator for 45-60 minues or until cool and a little firm. Meanwhile, put the remaining chunk of butter in the freezer to chill it thoroughly (it needs to be hard). Lightly flour a countertop and roll the dough out with the short edge facing you into a long rectangle, about 20x50cm (although the exact measurements are not crucial). Brush off any excess flour. Take the butter out of the freezer and coarsely grate it over the bottom two-thirds of the dough. Fold the top third of the dough over the middle third, then fold the bottom third over the other two-thirds, as if folding a business letter. This is known as the first turn. Wrap the dough in plastic wrap and chill in the refrigerator for 20 minutes. Remove the dough from the refrigerator and turn the dough 90 degrees so that the open ends are facing you, with the seams on the right. Repeat the rolling process, and before folding, sprinkle the dough with half the remaining sugar. Fold the dough into thirds as before and repeat this a second time. Wrap the finished dough in plastic wrap and chill for 30 minutes before using. Any longer and the sugar will start to liquefy and the dough will become difficult to work with. Line a large baking sheet with parchment paper. Remove the dough from the refrigerator and cover the countertop with a small amount of caster sugar. Roll the dough out as before. Using a sharp knife, trim the edges of the dough, then cut the pastry into two strips, and divide each strip into five equal squares. Fold the corners of each square into the centre and press gently to secure in place. Put each pastry on the prepared baking sheets, preferably inside lightly buttered tart rings (these help to give the pastries a better shape; if you don’t have them, you can bake the pastries inside buttered muffin tins although I find them to a little on the denser side this way). Leave the pastries to rest for 30 minutes. Preheat the oven to 190C / 375F. Bake for 20 to 25 minutes until golden brown and the sugar has caramelised. Remove from the oven and remove the tart rings, if using, then leave the pastries to cool on the baking sheet. I prefer to serve these at room temperature when the sugar on the outside has set, giving you a wonderful texture. They are best served on the day they are made. From my book Patisserie Made Simple - buy here! I have been making version of these savoury scones for years, switching up the flavours on a whim or according to whatever ingredient is in season. My favourite incarnation of these scones though has to be ones that in some manner include wild garlic. This magical ingredient, which grows wild all across the UK which means if you want to go foraging then this recipe is for you (just be careful wild garlic looks annoyingly similar to lily of the valley which is poisonous so if your confident with distinguishing between the two it is best to find a different source). Generally I find the best place to go looking for the garlic is in damp woodland, where it often grows in abundance. The only other tip I will give you, because im no foraging expert, is that avoid the garlic that is close to the paths and walkways. As these areas are popular with dog walkers the garlic on the sides of the paths has a big risk of being contaminated and not something you want to eat. But enough with that lets talk flavour, in these scones I have paired them with cheese as is common for a savoury scone plus a little background fennel seed with a final flourish topping the scones with a liberal dusting of zataar, a lebanese herb blend that I have a particular fondness for especially alongside egg and cheese. To make the scones line a couple baking trays with parchment paper and preheat the oven to 190C (170C fan). In a large bowl mix together the flour, baking powder and salt. The addition of baking powder when you are already using self raising flour is simply that cheese scones can have a tendency to be on the heavy side and need a helping hand to rise and stay light. Toss the butter through the flour and then using your hands or a pastry blender rub in the flour until the butter is in irregular sized pieces, non larger than peas. Mix in the cheddar, bacon wild garlic and fennel seeds, evenly distributing the ingredients. Whisk together the milk and eggs then pour into the middle of the scone mixture, then using a butter knife mix to form a shaggy dough. Tip the dough out onto a floured worksurface and use your hands to briefly bring together to form a uniform dough. Lightly flour the worksurface and roll or press out to a thickness of about 2.5cm thick. Use a 7cm round cookie cutter cut out as many scones as possible. Gently re-knead the off cuts to cut out the last few scones. Transfer to the baking trays. To finish lightly brush the top of the scones with a little beaten egg and sprinkle with a healthy dose of zataar and a little extra grated cheese. Bake in the preheated oven for 25 minutes or until golden on top. Best served still a little warm, within a couple days of baking. The scones can also be frozen once fully cooled. I seem to become easily obsessed with ingredients, some become short lived obsessions some stick around for years. Tahini has become my most recent obsession, I have been sneaking it into as many recipes as I can. The recipe that started this love affair was a chocolate tahini bundt cake that I developed for Olive Magazine (it's still one of my favourites). The combo of chocoalte and tahini is magical, it just works. If you've never had tahini in a sweet recipe think of it playing a similar role to peanut butter, it has a deep roasted sesame flavour and works beautifully in sweet recipes. This cookie recipe was inspired by a picture of shortbread from a bakery in the states; it was thick and simply served, no adornment, no filling, just simply served sprinkled with black and white sesame seeds. In my mind this turned into what we have here, a crisp tahini shortbread sandwiched together with a salted honey ganache and like most recipes that sit on that line of sweet and savoury they're incredibly moreish, they're also slice and bake cookies making them quick and easy to make. To make the cookies place the butter and sugars into the bowl of a stand mixer, along with the vanilla and salt. With the paddle attachment beat together for about 5 minutes or until light and fluffy. Scrape in the tahini and mix briefly to combine. Add the flour and mix briefly just until combined, you want to avoid over mixing at this point as the cookies will come out tough. Tip the dough out onto the worksurface and use your hands to bring together into a uniform dough. Cut the dough in half and form into thick sausage shapes, roughly 5cm thick. As these are slice and bake cookies you want to get these logs as round as possible, if you want to learn a nice tip on how to do this you can watch the video. Wrap the logs of dough in clingfilm and refrigerate for about 4 hours until firm. Preheat the oven to 180C 350F and line three baking trays with parchment paper. Using a thin sharp knife cut the cookies into rounds, about 4-5mm thick and place onto the prepared baking trays. Dont worry too much about the cookies spreading, you can leave just a couple cm's between each cookie. Lightly brush each cookie with egg white and sprinkle liberally with the sesame seed mix. Bake in the preheated oven for about 10-12 minutes or until lightly browned. Allow to cool on the baking trays. For the filling place the cream, honey, tahini and salt into a small saucepan and over medium heat bring to a simmer. Make sure to stir this mixture regularly as the honey will sink to the bottom of the pan catching and burning quite quickly. Once at a simmer pour the cream mixture into a bowl with the chocolate and sit for a couple minutes before stirring together to form a silky smooth ganache. Set aside until thickened enough to hold its shape then scrape into a piping back and pine rounds of ganache onto half of the cookies, sandwiching together with a second cookie. Over the time the ganache will soften the cookies so I prefer to keep these in a sealed container in the fridge, where they will keep for up to four days. Considering how many times I have made this cake recently you could easily expect me to be completely sick of it. This recipe, a twist on a classic pound cake, infused with passion fruit and glazed with dark chocolate, was originally made for my British Issue of the wonderful Bake From Scratch Magazine. One of the features I helped organise was the Bakers Potluck; we got some of the UK's best and brightest bakers together in a kitchen to bake, share and basically just enjoy each others company, it was an amazing day and a lot of fun. My recipe for the potluck had nothing really to do with British baking more my personal favourite styles and flavours. I am a big fan of Bundt cakes (I have way too many Bundt tins for my tiny kitchen) and the combination of chocolate and passionfruit which I go back to time and time again. The resulting cake was incredibly easy to make, a slight tweak on the all in one method and a cake that happily lasts for up to 5 days. When we set out on the Bake Like A Brit Tour with the magazine this was the recipe we decided to demo at each stop of the tour. We were also sponsored by the fabulous Guittard Chocolate of San Francisco and the brilliant bakeware company, and the inventor of the Bundt Pan, Nordicware from Minneapolis, so the recipe was the perfect fit. Note: This version of the cake is slightly different from the version that appears in the magazine, that is because it was originally developed for a larger Bundt pan, so it has been reduced to fit the Crown Bundt pan that I used for this post (if you watch the video for this recipe you will see why I reduced the recipe slightly). Preheat the oven to 180C (160C fan) and lightly grease a 10-cup capacity bundt cake pan. Lightly dust the inside of the pan with a little extra flour and tap out any excess leaving a thin coating. These steps will help ensure the cake comes out clean. I personally prefer to use a spray oil for this and it ensures a thin coating then gets into every nook of the pan. In a large bowl whisk together the eggs, caster sugar and lemon zest using a electric mixer, on high speed, for about 5 minutes or until the mixture is pale and light. Meanwhile, in a jug whisk together the oil, yoghurt and passion fruit puree. Add the oil mixture to the egg mixture and whisk briefly to combine. In a separate bowl mix together all the dry goods, then add to the liquid goods and mix briefly just until evenly combined. Pour the batter into the prepared Bundt pan and set onto a baking tray and bake in the preheated oven for about 45-50 minutes or until a skewer inserted into the cakes comes out clean. When it comes to turning out a Bundt without damaging the cake I find the best thing you can do is place the cake onto a wire rack for exactly ten minutes before attempting to turn it out. If you try and remove the cake any earlier it will not have had enough time to fully set so is more likely to break apart. If you wait much longer the cake can become a little sticky and wedge itself inside the pan, so 10 minutes is that perfect sweet spot. Once the cake has been removed from the pan and is cooling on a wire rack make the syrup. In a small saucepan bring the passion fruit and sugar to a simmer, cooking just until the sugar has been dissolved. Whilst the cake is still warm brush the syrup all over, allowing it soak into the cake. Set the cake aside until fully cool. Once ready to glaze place the chocolate discs into a bowl and the cream into a small saucepan. Bring the cream to a simmer and pour over the chocolate, setting aside for a couple minutes before stirring together to form a silky ganache. Set the glaze in the fridge for about 15-20 minutes or until the glaze has thickened up but it still pourable. Set the cake, still on a wire rack, over a piece of parchment paper and pour the ganache all over the cake (the paper will catch any drips that fall from the cake). Kept in a sealed container this cake will keep for up to 5 days. This weeks recipe is the last in my healthy baking series with Weightwatchers, and this week its a simple thai inspired baked cod. Its a super healthy dish packed full of flavour and I love the taste of this dish, its bright and fresh and the fennel adds a great texture, lots of crunch. If you haven't seen the other recipes head to my youtube channel to watch the other three episodes. To make this dish I make a paste full of herbs, gingers and a little bit of heat from red chilli, this is spread over cod fillets and baked, then served with fennel that is grilled with chilli, lime and soy sauce. Its a simple side but I love it, the fennel still retains a little crunch but is infused with great flavour, even if you dont serve this with the cod it is a great side. Preheat the oven to 200C (180C fan) and line a baking tray with parchment paper. Blitz the ginger, lemongrass, green chillies, garlic, shallots, lime and fish sauce with and hand blender or a mini chopper until a rough mixture is formed. Place the fillets of cod onto the prepared baking tray and spread the paste over the top. Mix together the red chilli, lime juice, olive oil and soy sauce and pour over the fennel, tossing to coat. Heat a griddle pan over medium/high heat and once hot, cook the fennel for about 4-5 minutes per side, cooking until dark grill marks appear. Once cooked, surround the fish with the fennel and bake in the oven for about 22-25 minutes until the fish is cooked through. It might be a dessert straight from the 80's but I still love chocolate mousse. Take me to a french bistro, give me that large bowl of chocolate mousse and let me dig in. I don't need many adornments but a little lightly baked rhubarb, to go with the dark chocolate, works wonders. This is another recipe that is part of my healthy eating series where I have paired with WeightWatchers for their new Flex Programme, and I know what your thinking, how is chocolate mousse healthy. When it comes to this recipe I have reduced the sugar and fat to make this a bare bones mousse, just chocolate, a little tough of sugar and eggs, no butter and no cream, but absolutely delicious. To make the chocolate mousse place a small bowl over a pan of gently simmering water, making sure the bottom of the bowl doesn't touch the water. Add the chocolate and heat, stirring occasionally, until fully melted. Remove the bowl and set aside for the moment. Place the egg whites into a large bowl and whisk with a hand mixer until foamy. Add the caster sugar 1 tablespoon at a time, whisking for a minute before adding the second. Continue whisking on high speed until the meringue holds medium peaks. Working quickly, add the yolks to a large bowl and mix in the orange juice. Pour in the melted chocolate, mixing until fully combined. Add a large spoonful of the egg whites and mix in. Fold in the rest of the meringue one third at a time. Once fully combined, divide the mousse between 4 glasses and refrigerate for 4 hours before serving. Place the rhubarb into a small roasting tin with the honey, orange juice and the ginger, tossing together to coat. Roast in the oven for 10-15 minutes or until softened but still holding its shape. Top the mousse with the rhubarb and any syrup that is in the pan. Top with a few toasted flaked almonds. Happy Valentines Day! I might not be a fan of the more obvious, throw some hearts on, Valentines Day baking this vibrant blood orange cake just happens to be bright pink so might be the perfect cake if you are looking for something edible this Valentines Day. Made with my winter obsession this pound cake is infused with blood orange flavour. Firstly the zest is beaten with butter and sugar, releasing the strong oils and adding bags full of flavour. To layer in more orange flavour the cake, still fresh from the oven, is brushed liberally with a simple syrup made with blood orange juice and sugar, which soaks down into the cake adding more flavour plus moistness to boot. To finish the cake has yet more orange flavour added in the form of a classic icing sugar glaze and finished with segments of blood oranges and toasted flaked almonds. It is a simple cake with a surprising amount of elegance; its texture is velvety, the benefit of being made with a mix of butter and cream, its moist and keeps for days, and it has a delightful flavour. Whilst I have you here I also have a quick update. In the morning I am flying out to the states to start the #BakeLikeABrit tour with Bake From Scratch magazine. I cannot wait to get to San Francisco, our first stop on the tour and I am so excited to get our first event started. Make sure you follow along on Instagram where I will be posting lots of behind the scenes content. Whilst we have a lot planned on the trip we also have a few events you can get involved with. There will be a GIVEAWAY during the broadcast, with prizes including cake pans, cookbooks and chocolate. Join this event to get a reminder when the LIVE begins Friday, February 16th at 9:30am PST 5.30pm GMT. Whilst on the tour we will be doing two instore events at Williams Sonoma stores, the Edina store in Minneapolis and the Columbus Circle store in NYC. Tickets are $15 and include a copy of the magazine so a total steal, I cant wait to see you guys there. Heat the oven to 180C (fan 160C) and lightly grease a large loaf tin, lining with a strip of parchment paper. Put the sugar, butter and orange zest into a stand mixer fitted with the paddle and beat for about 5 minutes until light and fluffy. Add the eggs, a little a time, waiting until fully combined before adding more. Fold in the flour, salt and the baking powder and mix until smooth. Pour in the cream and gently mix to combine. Spoon into the loaf tin and bake for 55-60 minutes or until a skewer inserted into the middle comes out clean. While the cake bakes, put the orange juice and sugar into a small pan and bring to a gentle simmer, cooking until the sugar has dissolved. Remove from the heat. Allow the cake to cool in the tin for 10 minutes before transferring to a wire rack set over a piece of baking paper. Using a skewer, poke holes all over the top, sides and base of the cake. Brush the syrup all over the cake, coating the entire surface. Allow to cool. To make the glaze, slowly mix in icing sugar to the orange juice, adding just enough to make a glaze that is thick and pourable. Add a small pinch of salt and mix to combine, this helps temper the sweetness a little. Pour the glaze all over the cake, allowing to drip downs the sides of the cake. Allow the glaze to set for 20-30 minutes before topping with segments of blood orange and flaked almonds. This cake will keep for 3-4 days in an airtight container. It is a Friday in February so that must mean it is time for another episode of #WWFoodieFriday and another fabulous healthy recipe that fits perfectly into the WeightWatchers Flex Programme. This one in particular has become a firm favourite in my house, in fact when I make it I actually portion and freeze a bunch so that I always have a dinner at the ready. Everyone loves a curry and this simple dish, ready in just over 30 minutes, might not be authentic or traditional but its a fabulous dish. It is actually based on a dish my boyfriend makes regularly and I always say it is that recipe I would want when I am ill, it is wonderfully comforting. To make the curry we first need to make the curry paste, add all of the ingredients into a small food processor and pulse until a paste is formed (make sure to add the whole coriander, stalks and all, these add lots of flavour). You can also make this by very finely chopping the garlic, ginger and coriander and mixing together with the remaining paste ingredients. To a large saucepan add a little bit of oil and over a medium/low heat cook the onions for 5-10 minutes or until translucent. Add the curry paste and cook for a few minutes to take the raw edge off the spices. Add the lentils and stir to coat in the paste. Add the stock and the tinned tomatoes, increasing the heat slightly to bring the mixture to a boil, then reduce to a simmer and cook for 5 minutes before adding the chicken and cooking for 5-10 minutes or until the lentils and chicken are cooked through. Add the spinach and coconut milk stirring to combine. Serve in bowls topped with a dollop of natural yoghurt, and a little extra coriander.